Unable to get any satisfaction from Glee, 20th Century Fox Television, or its lawyers, Jonathan Coulton has put his version of of Sir Mix-a-Lot's "Baby Got Back" on iTunes, called it "my cover of Glee's cover of my cover," and will give proceeds from its sale through February to charity. 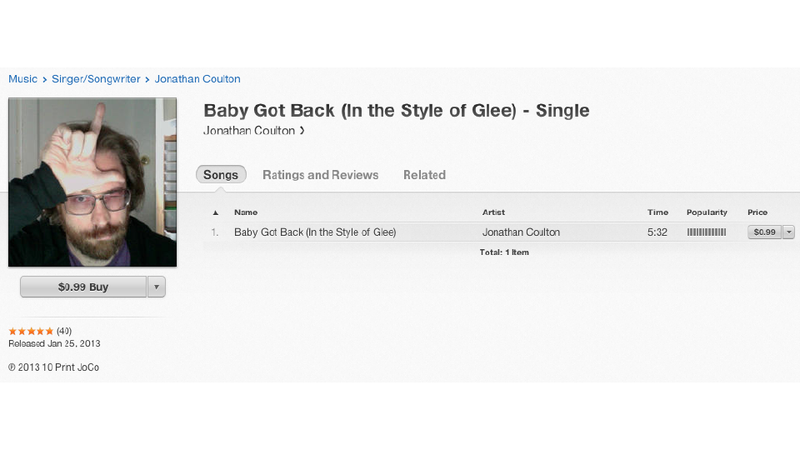 Coulton put the song on iTunes today under the title "Baby Got Back (In the Style of Glee)." For good measure, he changed his iTunes icon to a picture of him making the L-for-Loser hand gesture, which is used in Glee's logo. Coulton is the artist who wrote and composed Still Alive, the iconic closing-credits song of Portal.